From the red-brick exterior to the yellow specked starry murals of the inside ceiling art, the magnificent, meticulously carved altar piece and the curiously mismatched towers of the church’s façade, this is a building that oozes with elegance and mystery; at once both awe-inspiring and thought provoking, and indelibly submerged in legends of this Slavic town. Originally built in the 13th century, the basilica seen today is a 14th century reconstruction that was made necessary by the invading Mongol armies that left Kraków in ruins in 1259. Aside from the red medieval frontispiece and Gothic decorations that have become typical features of Polish cathedral architecture, visitors are reminded every hour of the church’s central place in Cracovian history, when a single trumpeter plays the so called Hejnal Mariacki from atop of St. Mary’s tallest tower. This short trumpet tune pays homage to the now legendary Polish townsman that warned the city of an impending Mongol attack in the 13th century. Kraków was saved, but the trumpeter’s tune was cut short, just as it is today to commemorate the untimely demise of the city’s heroic saviour who was promptly shot in the neck by a Mongol archer. But, as with most things Kraków, the legends don’t stop there. The two towers that form the frontal façade of the church tell another story. Their glaringly mismatched heights supposedly stem from a gruesome fratricide that quickly ended construction. The story goes that two brothers were engaged as architects (one on each tower) and, as one began overshadowing the other, jealousy set in. In a moment of dark inspiration, the jealous party murdered his brother but then promptly threw himself off the taller tower when he realised just what he had done. The interior of the church is a blue and gold patchwork of elegant decoration and Gothic arches. Here, the focal point is the magnificent wooden altarpiece at the church’s far end, carved over 12 years by the German sculptor Veit Stoss and completed in 1489. Hailed as the best example of 15th century wood carving art, the hinged triptych altarpiece is an elaborate series of religious depictions decorated in gold. Its twelve panels tell the story of the life of Mary, while the largest, central section shows the twelve apostles witnessing the death of Jesus’ mother and her subsequent ascension to heaven. 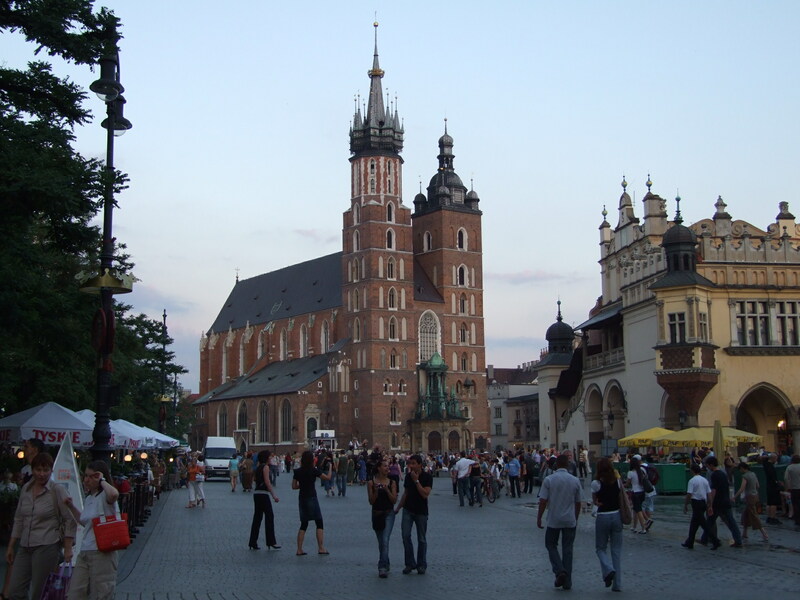 There is perhaps no building in Kraków more entwined in the city’s story than the Basilica of St. Mary. It is the jewel of Kraków’s old town, and stands as a symbolic architectural reminder of the long history, medieval beginnings and religious zeal that are the characteristic backbones of this Polish metropolis. Whether coated with a dusting of Cracovian snow, or enjoyed with a cold Polish beer in the sun from the market square below, the crevices and corners of this beautifully crafted building never fail to impress.